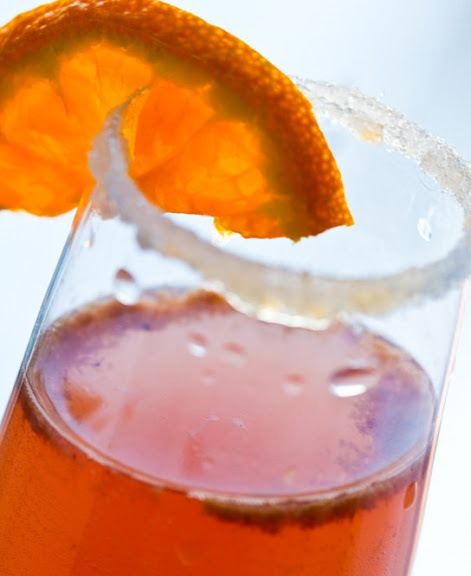 10 Recipes to Make Bubbly: Extraordinary! 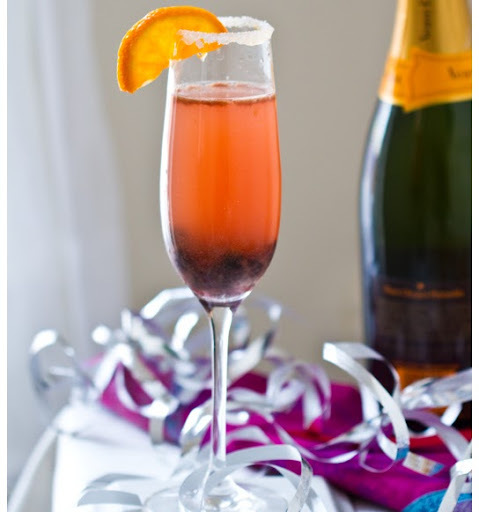 10 Easy Drink Recipes to Make Your New Year's Eve Bubby Extraordinary! 1. The Pom-Secco - Pomegranate-Infused. This has to be one of my favorite easy recipes for turning an ordinary glass of prosecco into something divine. It's easy. Fill your glass 3/4 full with a well-chilled average priced prosecco (a $10 bottle will totally work). Then crush or squeeze a fresh pomegranate for juice. Top off the remaining portion of your glass with fresh pom juice. Garnish with pomegranate seeds and optional mint. 2. The Fizzy Grape - Concord Grape Fizz. For anyone who used to enjoy 'grape soda' as a kid - here is the adult version! Fill 3/4 of your glass with any well-chilled fizzy bevie (prosecco, cava, champagne or sparkling wine). Then top off your glass with a high quality, dark purple Concord Grape Juice. Garnish with sliced black grapes. 3. 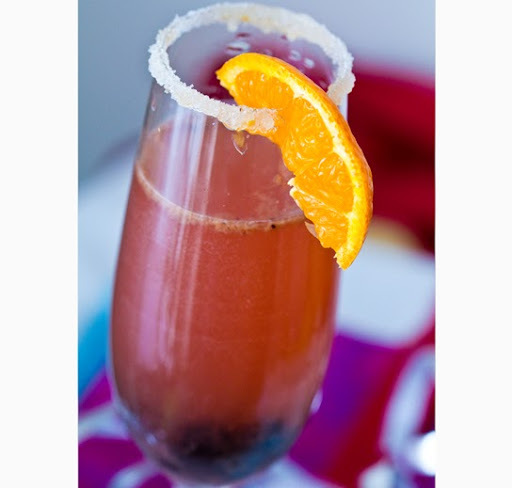 Sunset Rosé Mimosa - Cherry-Citrus Rosé. 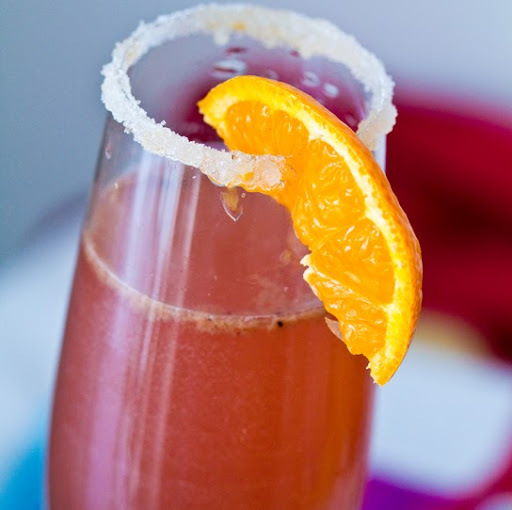 We all love the classic OJ/champagne bevie, the Mimosa. Well here is a twist on the classic. Freshly squeeze 1 grapefruit and 1 orange. Set juice aside. Fill each glass just over half way with well-chilled rosé sparkling wine. Then top off with a splash of fresh grapefruit juice, a splash of fresh orange juice. Lastly, have a jar of cherries handy. Add a very small splash of the cherry juice from the jar. And garnish with a cherry at the bottom of the glass. Add an orange segment to the rim of the glass. 4. Fizzy Mojito - Sweet Mint and Lime. This really does taste yummy! You basically muddle a bit of mint/lime/sugar just as you would for a classic Mojito. But instead of adding hard alcohol and fizzy water, you will be adding chilled sparkling wine/cava or prosecco. Garnish with a lime segment. 5. Cran-Fizz - Cranberry Zing. Easy and refreshing. Fill the glass 3/4 with your chilled fizzy wine and top off with a high quality cranberry juice. I like to add a few frozen blueberries to the glass for this one. Another nice garnish with this one is to ad chopped kiwis to the glass. 6. Blue Angel - Simple Frozen Blueberries and Citrus. (pictured above) Blueberry lovers try this way-too-easy fizzy bevie. Sometimes my champagne is not as chilled as I'd like, so I will add frozen fruit to the glass. This adds the coldness of ice cubes without watering down my drink. Fill your glass with chilled champagne and add about ten frozen blueberries. (I like to use wild blueberries for their deep rich color.) In a few minutes your champagne will turn light blue and has a very subtle chilled sweetness infused into each sip. You can also do this with frozen raspberries or strawberries. I also add a splash of cranberry or pomegranate juice and a squeeze of tangerine or satsuma. I like to sugar-rim my Blue Angel glass: squeeze citrus around the rim, then dip into sugar crystals. Citrus wedge too. 7. Quickie Sangria Champagne - Apple, Citrus, Berry. I adore Sangria, so I crafted this easy recipe to make a quick glass using basic champagne instead of wine. First, slice an orange into small thin segments. Add to a large glass. Add a nice splash of cranberry (any berry juice will work) or grape juice as well as a splash of ginger ale. Then add a handful of sliced apples. A few chopped grapes would be nice too. Lastly, squeeze an orange into this glass as well as a splash of lime juice. I never measure - I just throw in these basic ingredients and it works. Then mix this mixture around a bit. Then for each glass I add 2/3 sparkling wine and 1/3 sangria mixture. Be sure to add a few slices of fruit to each glass as well. 8. Spicy Mimosa - Cayenne Accented. 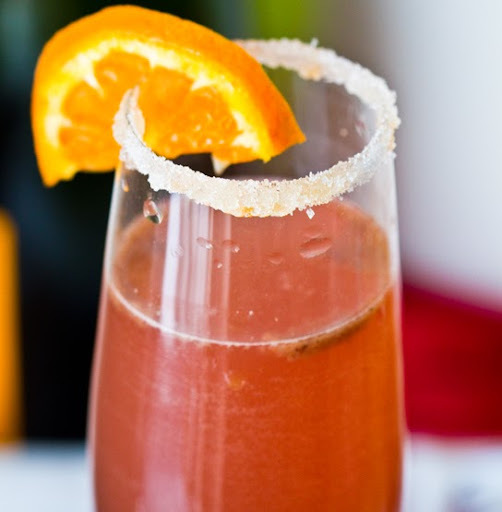 Easy upgrade to the classic OJ + champagne Mimosa - simply add a dash of cayenne to each glass. This adds another layer of flavor. 9. Tropical Fizzy - Pineapple Lime. 3/4 well-chilled sparkling wine and 1/4 pineapple juice. A spritz of lime. I like to sugar-rim the glass and add a few grates of lime zest. 10. Golden Apple Fizz - Ginger and Apple. Another really easy bevie! 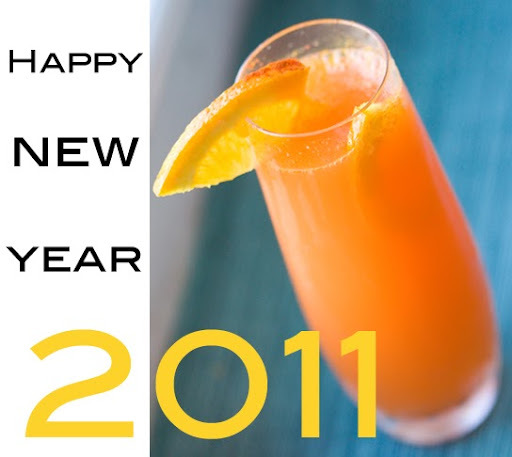 3/4 glass on chilled sparkling wine, then add a dash of strong ginger ale and a dash of apple cider. I also add a few bits of diced apple to each glass. Fizzy, light and spicy from the ginger. Add a dash of cayenne for extra spice. * New Year's Eve Tradition: Soba Noodles! * Hangover Helper: Coconut Water for Hydration! I hope you all enjoy your bevies for New Year!